Ehm... Your basic script? the cordinates you make the new star with? it wouldn't be the same as our real solar system? 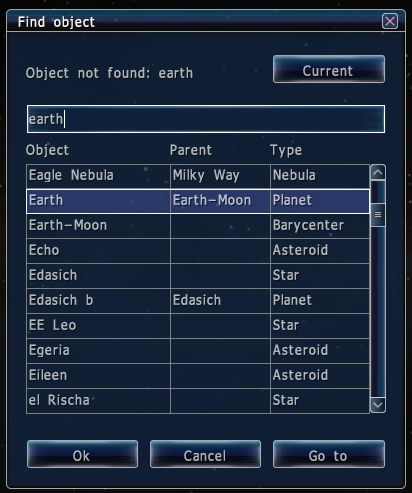 I used it to make a test star and, well... Earth cannot be found along all our other planets when i press (go to) when i select them in search bar. 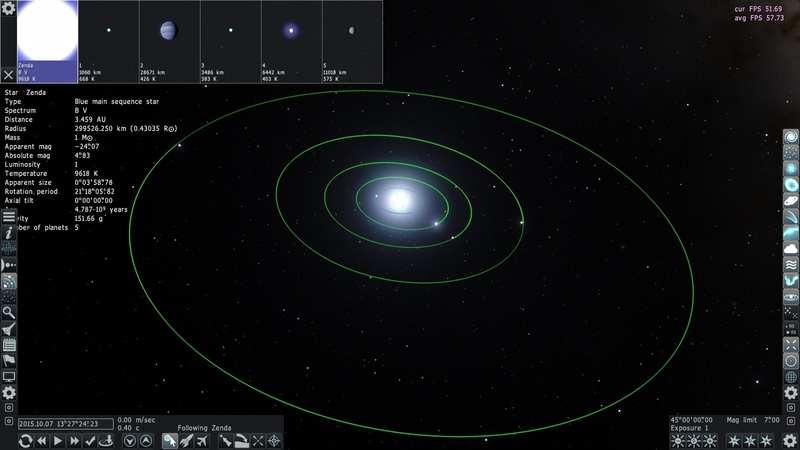 Noticed the new star i made is located where it seems our real solar system used to be. Is it gone forever or will it reappear when i move the new star i made? And is there any guides to help you pin down cordinates for where you want to make the star? if you have made a script, and then the earth is gone, then you might have forgotten a bracket in your script. Can you post the script here? 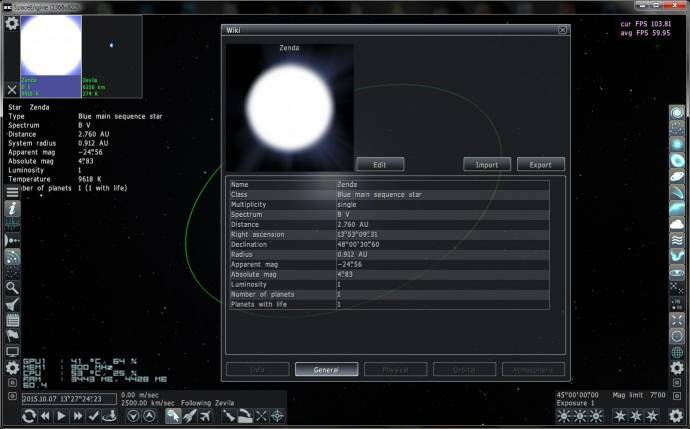 // Create a new object - star "Zenda"
Also... Is it a way to get coordinates from your camera location while in SE and then use them here to create the star? Or would it just be easier to locate a star at the location that is all ready generated there and then export it for editing? I removed the new star i made but earth is stil gone? how can i fix this? Is my installation broken because of the new star i made? Here is what happends when i try to search for planets in our system and then ask it to go there. Just getting "planet not found"
I used OP's script. Only change i did to it was the name just to see if i could make a new star. Now our system is completely gone. Strange the search thing has it but cant find it's location. have you made any changes to the 'universe.cfg'? Maybe you made a mistake. Try to undo the changes. Or on the original 'star.sc' file? Restore the original state. Or at the pak file? Never change anything at the original pak files. At your star everything is okay. JackDole, No i didn't change anything in universe.cfg as i remember. I looked at it only. Then i made the folder "stars" in catalogs. I placed the script in the "stars" folder and named the script "Stars.sc" in Notepad++ with the code i sent up ahead. The code is copy paste from the tutorial on the beginning of the thread. I have not even touched the pak files. I only made the script inside the "stars" folder. We are talking about the issue where Earth and all our other planets in our real system just disappeared completely after i made the star. Yes the star works fine but i didn't want to remove Earth. the name of the original file for stars in .pak archives is 'stars.sc'. You can not use this name for your scripts. JackDole, Ah... See where i did wrong. But do i stil need to reinstall to fix it or just rename the file i made? In the 'stars.sc' file is also our sun. Once you've made a script with this name - and SpaceEngine always uses the latest file by that name - have you virtually 'killed' our sun. The planets are in the 'SolarSys.sc' file. Therefore, they still appear in the browser, but can no longer be selected. Go to the position where you want your system. Select a nearby star. As close as possible. Open with 'F2' the system browser'. Go to the earth, but let the system browser open. Select the star in the system browser with a 'right-click'. Open the info window (Wiki). Write down these values and use them for your system. Change it a little in the minutes or seconds; so your star does not sit in exactly the same position as this star. The further away is the star of the earth, the smaller have to be changes. To my knowledge, there is no more accurate method. Is it possible to find/locate a system and then export it. Then add it in the catalog/stars folder with name ex: Zenda and then edit that? I thought it would be easier to just export a system i find and then just edit it. Like edit the planets etc. in the file. I want to make a planet with life orbiting a gas giant so i located a nice system i found (procedural generated) and exported it like i told here. I replaced the Zenda file because i want this to be the system i made. Then i found a temperate moon around one of the gass giants. I exported another planet i found with life that has the terrain i want on it. I copied the surface information along the atmosphere information and placed them correctly (replaced the previous settings on the code of the moon) and some other stuff to turn it into a terra. But no changes happends in Space Engine? Not sure what i have done wrong but i can post the part of the system code regarding this planet. This is from a complete system code regarding the system. I edited one of the moons on the gas giant in it. That code is copy pasted from the moon i edited. I combined it with information from earth and that other planet to make it into the planet i wanted. When i launch SE no changes is done to the system. I don't know why. How am i supposed to edit a system if possible since this code doesn't change anything to it? I have included the address to the code in universe.cfg like told earlier. You have to click the star with the right mouse button. For your planetary system you need an own script. I call it 'ZendaSys.sc'. And 'SemiMajorAxis' must be a little larger. This is the distance of the planet to the star in astronomical units. And remember, if you make your own planets around a star; will SpaceEngine no more create random planets. It is possible a system to exportierne and to adapt. But that's a lot of work. 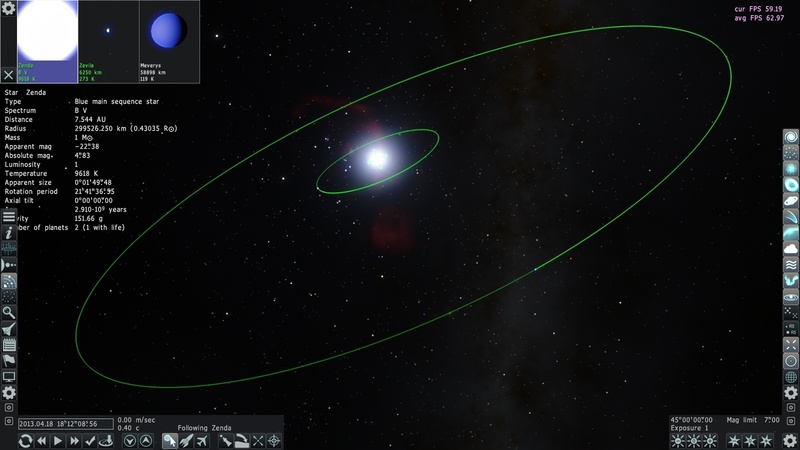 I managed to make a new star now with the location i want but not sure what you mean with the planet thing. Ok i made a new file located in planets catalog folder. Called it ZendaSys.sc and also made sure it is addressed in the universe.cfg. I made a script for a Gas giant with help of exporting another gas giant i found. made sure parent body was "Zenda" as it is going to orbit that star i made. I changed the mass and size a tiny amount to just have it a little different so there is not 2 completely like gas giant in the universe (immersive vise). When i restart SE the gas giant i made a script for refuse to spawn. The procedural planets stays but not the new planet i made a script for. Can you please tell me what i did wrong in the ZendaSys script? For me it works. I have done your two planets together. For any system that you are creating, you need at least two scripts. A script for the 'Star', or if you want a multiple solar system, the 'StarBarycenter'. In this script are only 'Stars' or 'StarBarycenter'. And a script for the planetary system. In this script are the planets. In a multiple star system also the stars. This script belongs in 'catalogs\planets'. If you do that so it must be working. I have attached the 'ZendaSys.sc' script. That is what i did. I made Zenda a own script only for the star placed in the "stars" folder in catalog. Then i made a script for the planets in "planets" folder in catalog with the gas giant script as showed above named Meverys. But it refuses to spawn here and i have done exactly what you said.